So, what do all those knitting terms and words actually mean? Maybe you are looking at some knitting pattern instructions and scratching your head. Terms and phrases in knitting are like shorthand and it's like a special language. They're used to shorten a long knitting pattern and also make the pattern a little more interesting to read. I think the terms and knitting abbreviations are pretty much the same. They both decipher words and phrases. Understanding phrases and knitting terminology will get a lot easier as you go along. And the more you read patterns and various knitting books you'll find that it all starts to make more sense. Eventually you won't even give it another thought. Here's a basic list of common knitting terms to get you started; kind of like a knitting glossary which I will continue to add to as I go along. As with everything knitting there is always a new knitting word, phrase or knitting term that seems to pop up but you'll learn them as you go along. The back of work is the side that faces away from you when you are holding the needles. Blocking is a finishing technique where you lay your finished pieces out flat and dampen or steam them. This helps to form and shape them and also helps define intricate stitch patterns. Continue in pattern - Continue working pattern as previously established. In other words - keep knitting the way you were originally. Last row to work will be a right side row so you may see something like this: Continue working as established ending with a right side (RS) row. Last row to work will be a wrong side row so you may see something like this: Continue working as established ending with a wrong side (WS) row. When knitters are frogging their knitting it means that they're unraveling or ripping out their work. The side facing you when you hold your needles. It can be the right side or the wrong side of the work. The number of stitches and rows per inch - called knitting gauge. 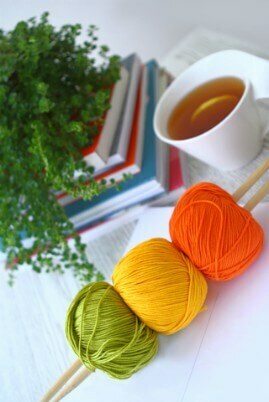 Adding a new ball of yarn to your knitting or adding a new color known as joining yarn. As if to knit - Begin knitting the next stitch like you are going to knit it. Common term to describe a pattern of knit and purl stitches. Rather than repeating the pattern over and over they'll say to repeat every row knitting the knit stitches and purling the purl stitches. I made a tutorial on ribbing stitches that teaches you how to knit the knits and purl the purls. As if to purl, begin next stitch like you are going to purl it. A term often seen in sweater patterns where the right front and left front are the same only the shaping needs to be reversed.What you do is work both fronts identical only you reverse the increases and decreases (the shaping). If one front was decreasing stitches at the beginning of the row then one front would be decreasing stitches at the end of the row. These are the edge stitches at both ends of your row of knitting. Sometimes an extra stitch or stitches is added to create a selvedge edge. Knitting a selvage edge makes seaming easier. Common method of showing changes in knitting pattern for other sizes. Small is usually first and then continues with other sizes in parentheses. It could also read as follows: 36 (38, 40, 42). Throughout the pattern you will follow directions for your specific size. Example: Instructions for size small may be to cast on 60 stitches and for a medium cast on 66 stitches and large 72 stitches so it would look like this: CO 60 (66, 72) sts. Tip: Highlight the size you are working with throughout the pattern. Continue knitting without making any increases or decreases. If you are still looking for a knitting term and can't find it here be sure to check out my page on knitting abbreviations as well. It may be there or drop me a line in the comments below and I'll be happy to help.